Location: Pornic, in the Loire-Atlantique departement of France (Pays de la Loire Region). Notes: Château de Pornic is located in the town of Pornic, 50 km from Nantes. Located on the north shore of the port of Pornic, the Castle has long been a symbol of the city. Today, the building is a private property that can only be visited during the European Heritage Days. The castle is bordered on one side by the ocean and is built on a defensive site, he assured the Middle Ages the defense of the port. 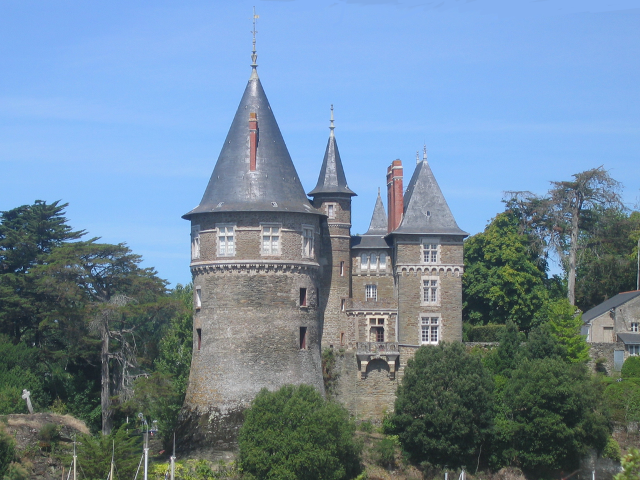 In the tenth century, Alan II, Duke of Brittany built the wood and made a strong place, it is then occupied by a garrison that protects the entrance to Pornic. In the twelfth century, it is the property of the lords of Rais that the stone rebuild and give it value. In the fifteenth century, it belongs to Gilles de Rais then confiscated by the Duke of Brittany at the time of his trial. In the eighteenth century, Alexander Marquis de Brie-Serrant, distinguished economist, bought the Barony of Retz in 1778. His property was confiscated during the French Revolution, and poor financial investments, have totally ruined. The barony of Retz is regulated only partially and all the castles of the Duchy are ruined when he died in 1814. In the nineteenth century, the castle of Pornic, belongs to Casimir Perier, Jacques Laffitte and Philip Francis Didier Usquin, bankers, creditors of the estate of the Marquis. In 1824 it was bought by the merchant Joseph Le Breton, Deputy Mayor of Nantes and founder of the establishment of sea bathing. He realizes a first restoration of the castle. In 1886, his descendants are called on architect François BouGouiN Nantes, to give it its present appearance, with arched windows paired brick, in the spirit of Italian architecture of the Château de Clisson. In 1986 the castle is listed as historical monuments.